Soapeez Mobile Valeting - Garage/Vehicle Services based in Gosport, Hampshire. 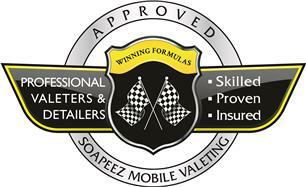 Hi, and welcome to Soapeez Mobile Valeting. Established in 2009, Chris and his team have been valeting and taking care of customers cars throughout the Hampshire area. Between the team, we have over 12 years experience in valeting and detailing. Chris started the business on his own through his love of cars. In 2015 Jaine joined the team. Together they have formed an excellent working relationship and even more importantly, a work ethic very few valeting companies have. In 2016 Soapeez joined the P.V.D. Association. They vet their members for being, Proven, Skilled and Insured! We cover the Hampshire and West Sussex areas. Maintenance Contracts. Our best valued service which is ideal for company vehicles. Chichester Hampshire, Fareham, Gosport, Portsmouth, Southampton.